We’d love your help. Let us know what’s wrong with this preview of Mhudi by Sol T. Plaatje. To ask other readers questions about Mhudi, please sign up. Mhudi was the first book assigned for my current English class, Multicultural Literary Studies. The class focuses on African and Caribbean literature, neither of which I'm very familiar with. My professor is a 60-year-old feisty black woman who grew up in the rural Midwest and has traveled to Africa several times (Senegal, South Africa, and Swaziland I believe). Forgive me for my brief departure from the book review, but I just have to say that I love this professor. Most of the class is spent l Mhudi was the first book assigned for my current English class, Multicultural Literary Studies. The class focuses on African and Caribbean literature, neither of which I'm very familiar with. My professor is a 60-year-old feisty black woman who grew up in the rural Midwest and has traveled to Africa several times (Senegal, South Africa, and Swaziland I believe). Forgive me for my brief departure from the book review, but I just have to say that I love this professor. Most of the class is spent listening to her tell stories about her life, childhood, and travels as they relate to our texts. And I don't think anyone in the class would complain. Unfortunately, she became ill at the beginning of the semester and was hospitalized with pneumonia. After sitting through three weeks of writing chapter summaries for a substitute who had no clue what was going on, I breathed a sigh of relief when she was able to return last Tuesday. She told us that when she got home from the hospital she was looking forward to going to the local bar and having a beer, a cigarette, and some fried chicken. Unfortunately, her friends had taken away her keys and left her with yogurt, vegetables, and Tofurky. The last of which she said was pretty good if you had it with some lettuce and tomato. Anyway. 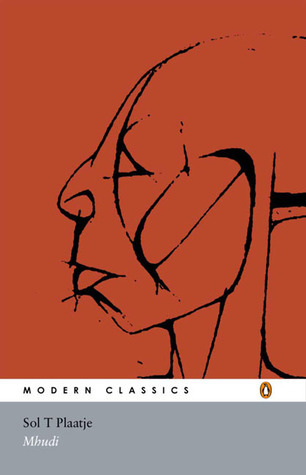 Mhudi is a notable book because it was the first full-length novel to be written in English by a black South African. It's an epic tale that centers around the eponymous heroine and is set during a time of great change in the country, namely, the wars of the 1830s. Under the rule of King Mzilikazi, a tribe of fierce warriors known as the Matabele is quickly dominating a vast area of Barolong territory. When Mzilikazi sends two messengers to the capital city, Kunana, to collect a tribute, the chief of Kunana has them killed. In retaliation, the Matabele raid the town. The massacre leaves the majority of the inhabitants dead (including women and children). Ra-Thaga, a survivor of the attack, travels alone for several days before coming across Mhudi, a fellow survivor. They fall in love and create a home for themselves in the forest. Because of their solitude and the unique circumstances of their meeting, their union is very different from traditional marriages. They are no longer bound by traditional rituals and roles pertaining to culture and gender. Mhudi is daring and feisty, while Ra-Thaga is perhaps more tender-hearted than is typical. The novel follows the couple as they move to a village where other refugees from Kunana are living. At this point, many Dutch immigrants, voortrekkers, are traveling through the country searching for land to settle. They are prejudiced against the native population, but the two peoples are united in their dislike of Mzilikazi and the Matabele. Ra-Thaga strikes up an unlikely friendship with one of the settlers, or Boers, and they spend much time together, socializing and learning each others' languages. The Boers and the Barolong eventually team up to defeat the Matabele and drive them back out of the Barolong territory. Mhudi remains a pivotal character because she consistently defies the expectations of her as a wife and mother. She is so devoted to her husband that she travels to find him whenever she senses danger, which includes going to the battlefront (something that both pleases and embarrasses Ra-Thaga). 'Mhudi' is the first English novel to be published by a black South African, making this not only a significant piece of writing, but a historic milestone. The novel opens with the near complete destruction of the Barolong tribe by the Matabele under the rule of Mtzilikazi. Men, women and children were slaughtered indiscriminately. Only Ra-Taga and Mhudi survive. The two meet after many days of wondering, trying to find some human contact, living in terror of stumbling upon further Matabele. From 'Mhudi' is the first English novel to be published by a black South African, making this not only a significant piece of writing, but a historic milestone. The novel opens with the near complete destruction of the Barolong tribe by the Matabele under the rule of Mtzilikazi. Men, women and children were slaughtered indiscriminately. Only Ra-Taga and Mhudi survive. The two meet after many days of wondering, trying to find some human contact, living in terror of stumbling upon further Matabele. From here on, a love story evolves, staged on the background of what must have been a bloody war, as other tribes, joining forces with the Voortrekkers, take on the Matabele. The language in this novel was more clinical than figurative. I have a feeling that it carries the tone of oral tradition, as one does not generally talk as poetically as they write. However, don't assume that there is no imagery or detail. The vocabulary is fabulous (I love learning new words), and the characters are definitely very real. Sympathy is even raised for Mzilikazi by the end. The stars of this story were Mhudi and Umnandi, Umnandi being the favoured young wife of Mzilikazi; Mhudi, the loving wife to Ra-Taga. Considering the setting, the last thing I expected were strong female leads. But these two women added a sense of inner strength to all the testosterone (and bullets) flying around. Both broke with tradition and stood by their husbands. South African literature especially history is plagued with bias, propaganda and inaccuracies. Reason being that it is predominantly penned by White writers who are enabled by readily available resources to them. In Mhudi, Plaatje seeks to give a different perspective to certain false narrations. To give back dignity and truth to those misrepresented in main stream history. According to White historians , Zulus are barbaric savages who kill for no reason. Barolong and Basotho are painted as timid South African literature especially history is plagued with bias, propaganda and inaccuracies. Reason being that it is predominantly penned by White writers who are enabled by readily available resources to them. In Mhudi, Plaatje seeks to give a different perspective to certain false narrations. To give back dignity and truth to those misrepresented in main stream history. According to White historians , Zulus are barbaric savages who kill for no reason. Barolong and Basotho are painted as timid cowards who are allergic to war. Whites are portrayed as victors, saviours and a saintly lot. Black women are painted as non significant sub missives, who only play auxiliary and subservient roles. In a three in one love story Plaatje weaves a captivating tale of fiction that plays out during the battles of Difacane in the 1830s. Due to unresolved conflict with Shaka, the Khumalo tribe under King Msilikazi had to leave Natal in 1836 and migrated North, eventually settling in Zimbabwe in 1840. Plaatje relates of the nomadic and predatory nature of life , and the devastation of hostile tribal take overs. The author specifically centred on confrontations between Barolong, Vooetrekkers, the Bushmen, Basotho, the Karanna and the Griguas. A classic decorated with rich proverbs and idioms. Discover for yourself how Plaatje asserts that Barolong and Basotho were combative and brave, not purported poltroons. Quoted in the book " Maddened by these awful scenes the Barolong hurled themselves against the enemy and fought like fiends do "
That Matebele were not senseless blood thirsty killers. That Voortrekkers were not innocent God given angels. Find out about the strength, intuition, bravery , and influence Umnandi and Mhudi as representative of Black females portray. Of the Basotho it was writ " The Basotho inflicted upon the raiding Matebele such a severe punishment that they ran down the mountains and retired across plains on scattered format"
Plaatje creates a timeless, almost mythical feel in this story of survival and the need for human connections in a violent and uncertain world. The ending is ambiguous: Ra-Thaga and Mhudi head into a future they hope will be more peaceful and settled than their past, but Plaatje and we know the horrors of dispossession and oppression that await them as the Boers settle the land, so it's hard to take the characters' hopefulness at face value. Forty years ago I was studying African history and devouring every edition of the Heinemann African Writers Series, hungry to connect with the soul and lineage of the people of this land. Yet this pearl of South African writing didn’t even cross my radar amongst the wonderful books from our neighbours near and far: Chinua Achebe, Ngugi Wa Thiong’o, Ama Ata Aidoo, Sembene Ousmane, Bessie Head, and so many more. It was the homage paid to Mhudi by Achmat Dangor in Dikeledi: Child of Tears, No More that finally brought Sol Plaatje's book into my life - thought to be the first English novel by a black South African. I am grateful: this book fills so many gaps in our South African heritage. Written around 1920, it is extraordinarily modern in the strong feminist protagonist Mhudi, a Setswana Morolong woman. Throughout the book, women have agency and depth and are honoured for their crucial roles. The book is also remarkably clear sighted about both what happened between the different black and white tribes in the 1830s in the area where I now live, and what might have been. The spans the Highveld of South Africa from Botswana to Lesotho, and gives a great sense of the devastating impact and confusion of the difaqane and the Boer Trek. if [the Barolong under Tawana] imagine that they shall have rain and plenty under the protection of these wizards from the sea, they will gather some sense before long. Indeed it was not long before the Boers abandoned their alliance with the Barolong, and in 1852 at the Sand River Convention the British sided with the Boers in placing all the Barolong land under Boer dominion. On the other hand, he shows up sad parallels in the way humans can dehumanize those they see as "other" - from the Barolong questioning whether Matabele warriors are really human, to Mzilikazi calling the Barolong "dogs" to the Boers brutally torturing their black slaves. Cracks in the ideologies of indigenous resistance coming from a South African author himself. Fast read of a story of wisdom, resistance, and a shifting of the lens that provides a somewhat refreshing narrative compared to some other narratives circulating in 19th century novels. If you're looking for a historical-fiction treatment of the Matabele/Barolong conflict, this is the best one out there. I bought Mhudi ten years ago and could not go past the first page. Mhudi provides a fine fictionalized history of the clashes between rival South African tribes and Boers during the Mfecane era. Where the novel drags is as romance between two survivors of a massacre by the Matabele, a Zulu offshoot. The dialogue is highly expository, which as historical speeches a la Thucydides is fine, but as romance dull. Having read a few novels by/about Africans, I wonder if the Zulu/Bantu languages are as overly formally when translated to English as the conversations in t Mhudi provides a fine fictionalized history of the clashes between rival South African tribes and Boers during the Mfecane era. Where the novel drags is as romance between two survivors of a massacre by the Matabele, a Zulu offshoot. The dialogue is highly expository, which as historical speeches a la Thucydides is fine, but as romance dull. Having read a few novels by/about Africans, I wonder if the Zulu/Bantu languages are as overly formally when translated to English as the conversations in these stories or if there is some collective attempt by African authors to show how civilized and noble their heroes (and language) are. Also with one or two exceptions, I did not find the novel especially funny, which the blurbs on the back promised. Mhudi is a romance set against the historical backdrop of South African tribes’ clashes with each other and with white colonialists in the 1830’s. It is set in eastern South Africa, and its principal characters are Mhudi and Ra-Thaga, a Barolong couple who meet and marry after their village is destroyed by the fierce Matabele tribe. The Matabele are ruled by Mzilikazi, whose reputation as an unreasonable, bloodthirsty tyrant has forced most area tribes into fearful submission. In the end, howeve Mhudi is a romance set against the historical backdrop of South African tribes’ clashes with each other and with white colonialists in the 1830’s. It is set in eastern South Africa, and its principal characters are Mhudi and Ra-Thaga, a Barolong couple who meet and marry after their village is destroyed by the fierce Matabele tribe. The Matabele are ruled by Mzilikazi, whose reputation as an unreasonable, bloodthirsty tyrant has forced most area tribes into fearful submission. In the end, however, even the Matabele fall to the Dutch settlers who force their way inland with modern weaponry that the tribes believe must be magic. The epic chapters, in which battles and sweeping history are recounted, have a tone of despair on behalf of the smaller tribes as they are overrun first by the Matabele and then by the Dutch settlers. The romance chapters, which detail the personal lives of Mhudi and Ra-Thaga, have a much more positive tone, as their relationship deepens and their family grows and even thrives despite hardships. Sol Plaatje wrote Mhudi to provide a more balanced, insider’s view of the tribal wars, and to preserve elements of the South African tribal culture, including language and folklore. His messages include the devastations brought about by colonization, a call for humane treatment of all people, and the importance of strong family relationships to survival and happiness. He achieves his purpose by alternating the chapters between history and story, by including traditional South African folk tales in both, and by allowing the narrative point of view to switch between several characters. The book, first published in 1930, is perhaps most remarkable for its female heroine whose strength, courage and foresight, in everyday challenges and in affairs of battle, repeatedly save her husband, family, and community from harm. Apart from its historical status as the first novel by a black South African, this is an enjoyable historical novel, but not an especially outstanding one. The two main characters (who meet and become a couple in exile after a massacre of their tribe by a rival nation) are fun, especially the independent-minded Mhudi, but a little too noble to feel realistic. Despite this, it's not a black-and-white story of good and evil: it documents the uneasy alliances of the time between natives and the Boe Apart from its historical status as the first novel by a black South African, this is an enjoyable historical novel, but not an especially outstanding one. The two main characters (who meet and become a couple in exile after a massacre of their tribe by a rival nation) are fun, especially the independent-minded Mhudi, but a little too noble to feel realistic. Despite this, it's not a black-and-white story of good and evil: it documents the uneasy alliances of the time between natives and the Boer, and even the Matabele 'bad guys' are humanised towards the end. Mhudi is a story of survival, war, love and inter-racial friendship in a late-1800s Southern Africa that was only beginning to learn that such a thing is possible. Plaatje is one of SA's best writers and this book is a classic that I warmly recommend to all of those interested in learning more about this amazing country. The story of a Barolongo woman who flees when her village and tribe are massacred in the late nineteenth century, around the time of the Great Trek by the Boers, this is a remarkable novel for its gender dimensions, its complex view of colonialist and indigenous politics, and its weaving of myth with history. As a South African modernist novel, it is extraordinary. Beautifully written. A masterpiece that illuminates the tumultuous period that led to the colonization of South Africa known as the mfecane, but also highlights the most basic instincts and feelings of the human heart. The first book we read for Modern African Literature and a good one! It can be read in one sitting, portrays the complexities of conflict within southern Africa before the Dutch and British came, and is by a fascinating figure in literary history. Honestly, I should probably give this more than two stars, seeing how it was the very first novel written by an African, but I just can't. It was pretty bad. A beautiful African love story! This novel is important in the history of fiction in South Africa, and still an interesting read in its own right. Solomon Tshekisho Plaatje was born near Boshof, Orange Free State (now Free State Province, South Africa). He received a mission-education at Pniel. When he outpaced fellow learners he was given additional private tuition by a missionary, Ernst Westphal, and his wife. In February 1892, aged 15, he became a pupil-teacher, a post he held for two years. As an activist and politician he spent much of Solomon Tshekisho Plaatje was born near Boshof, Orange Free State (now Free State Province, South Africa). He received a mission-education at Pniel. When he outpaced fellow learners he was given additional private tuition by a missionary, Ernst Westphal, and his wife. In February 1892, aged 15, he became a pupil-teacher, a post he held for two years. As an activist and politician he spent much of his life in the struggle for the enfranchisement and liberation of African people. He was a founder member and first General Secretary of the South African Native National Congress (SANNC), which would later become the African National Congress (ANC). As a member of an SANNC deputation he would travel to England to protest the 1913 Native Land Act, and later to Canada and the United States where he met Marcus Garvey and W. E. B. Du Bois. While he grew up speaking the Tswana language, Plaatje would become a polyglot. Fluent in at least seven languages, he worked as a court interpreter during the Siege of Mafikeng, and translated works of William Shakespeare into Tswana. His talent for language would lead to a career in journalism and writing. He was editor and part-owner of Koranta ea Becoana (Bechuana Gazette) in Mafikeng, and in Kimberley Tsala ea Becoana (Bechuana Friend) and Tsala ea Batho (The Friend of the People). Plaatje was the first black South African to write a novel in English - Mhudi. Plaatje wrote the novel in 1919, but it was only published in 1930. In 1928 the Zulu writer R.R.R. Dhlomo published an English-language novel, entitled 'An African Tragedy', at the missionary Lovedale Press, in Alice. This makes Dhlomo's novel the first published black South African novel in English, even though Plaatje's 'Mhudi' had been written first. He also wrote Native Life in South Africa, which Neil Parsons describes as "one of the most remarkable books on Africa by one of the continent's most remarkable writers"; and Boer War Diary that was first published 40 years after his death.